Cinnamon, the bark of a tree native to Sri Lanka, is a versatile spice used in a variety of culinary traditions to flavor meat and rice dishes and as a key flavoring in many baked goods. Cayenne pepper, the fruit of pepper plants native to tropical and subtropical regions, has a long history of both culinary and medicinal uses. Both cinnamon and cayenne are warming herbs that offer potential weight-loss benefits. Consult your doctor before making changes to your diet or lifestyle. Cinnamon promotes weight loss by improving insulin resistance and reducing fasting blood sugar levels in high-calorie diets, according to a study published in the 2008 issue of the journal "PPAR Research." Fewer blood sugar swings equates to increased ability to manage hunger and appetite signals. Cinnamon also reduces free fatty acids and levels of low density lipoprotein, LDL, the bad form of cholesterol. Researchers conclude that its effects on stabilizing blood sugar may help promote weight loss in obese diabetics. 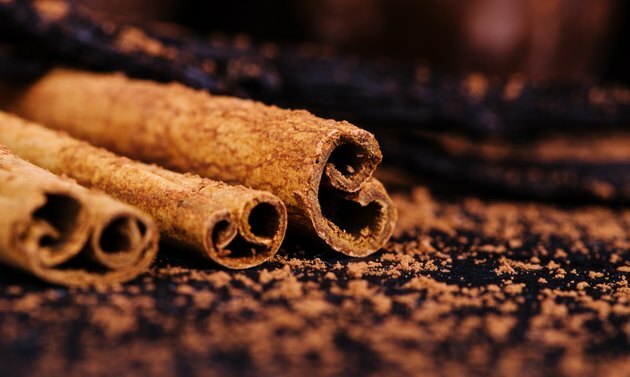 Cinnamon contributes natural sweetness to foods and can help you lose weight by decreasing your consumption of sugar and other calorie-laden sweeteners. Add 1 tsp. of cinnamon to your protein shakes, and you may find you can reduce some of the sugar content without missing the added flavor and calories that sugar brings. Sprinkle cinnamon on any foods that can benefit from added sweetness, such as oatmeal or toast, while leaving off the sugar. Try cinnamon mixed with peanut butter, and you may find you can live quite happily without the jelly. Cayenne is likely to help you lose weight by increasing blood flow and perspiration, both of which boost your metabolic rate, says David Dodson, M.D., author of the book "The Diet Pill Guide: The Consumer's Book of Over-the-Counter and Prescription Weight-Loss Pills and Supplements." One tsp. of cayenne pepper sauce with meals may increase your metabolic rate by as much as 25 percent. Start with low doses of 1/8 tsp. and work up to 1/4 tsp. at each meal. Always take cayenne pepper with food to prevent irritation of your stomach lining. Consult your doctor for guidance and supervision when using cayenne pepper for weight loss or to treat any medical condition. The increased metabolic rate you experience from cayenne pepper causes your body to burn more fat. Use cayenne during a cleansing juice fast to obtain the most cleansing and weight-loss benefits from this useful herb, says herbalist Stephen Harrod Butner, author of the book "The Natural Testosterone Plan: For Sexual Health and Energy." Cayenne provides the added benefit of warming your body during a cleanse, a time when you may experience a tendency toward cold hands and feet.